Maybe one of our readers in France can tell us more about this story. I came across a video on YouTube from "MrBuzz118" which showcases iCoyote, an iOS app for the iPhone. The app is AppRadio compatible (both SPH-DA01 and SPH-DA100) and from the looks of it seems pretty useful. It is not available in the United States or Canada but is meant for Europe only. My knowledge of French is limited but here's the video and what I think this app might be capable of doing. The app was showcased at the Mobile World Congress (MWC) 2012. It is currently available only in a few European countries but more countries are going to be added soon. From the video above it looks a lot like Waze. 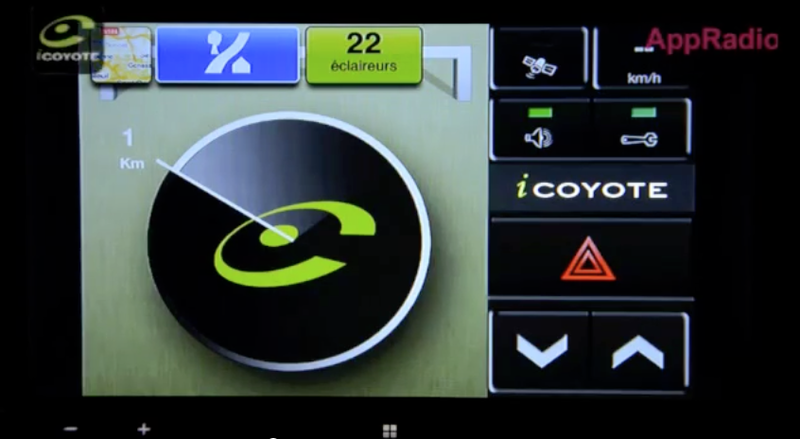 It features turn-by-turn navigation, incident reporting, traffic cameras and other traffic info. I'm not sure if this is available in the UK App Store but, Coyote Systems, which makes the app and also the Coyote standalone device, is based in the UK. iCoyote is also available on Android, Blackberry and Windows phone. The Android version is not AppRadio compatible. If any of our European readers have used iCoyote it would be nice to hear from them regarding the usefulness of this app. Please leave your comments below. iCoyote costs €1.59 in the French App Store. You can download it today.